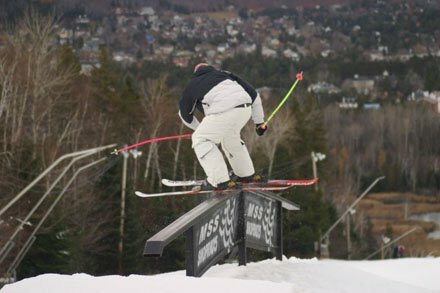 Words & Photos by cko With all eyes on the dropping temperatures north of Montreal over the last few weeks, everyone around the NS office was stoked to see Saint Sauveur blowing snow last weekend. In true Sauveur fashion, they managed an uber-early season opening of November 9th. And while we missed the first two days of the year, we couldn't hold out any longer and made the 45-minute trek north of town this Thursday. Gotta love snowmaking Along for the ride were myself, Doug Bishop, and Emily Bennett, and after battling some mid-morning city traffic we were on the slopes by 10:30. Now, considering the fact that it was the third day of the year and the surrounding landscape looked more suitable for a round of golf than skiing, we were stoked to see two rails already set up along with a makeshift tiny booter off to the side (which I managed to case repeatedly despite it's tiny stature). Doug working on the steeze It was great to get back on the slopes and the lack of a crowd made quick laps a breeze. 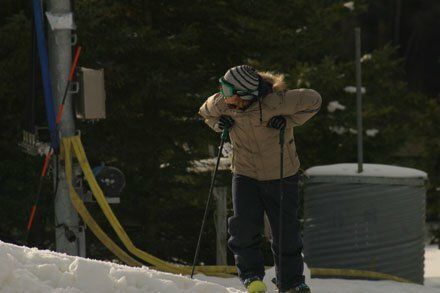 Doug honed his spins off of the down and a-frame rails while Emily played around with her lipslide take offs on the down. Poutine and Red Bull were consumed and the sun even made an appearance towards the end of the afternoon to cap off a very successful and injury-free first snow day. Emily locking it down. 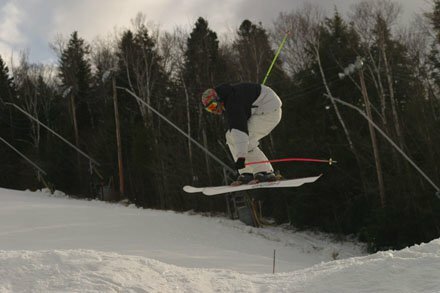 Sun is in the forecast and it looks like a large contingent of the NS crew will be back up on Saturday if all goes as planned, so if you're in the neighborhood drop by for a few runs and get your ski legs back. Doug airing over the tiny kicker. Not pictured: cko eating it to his face. Too cool for school? Maybe. There’s something special about shredding your local mountain in weather that most consider closer to golf, biking, climbing, even surfing season. 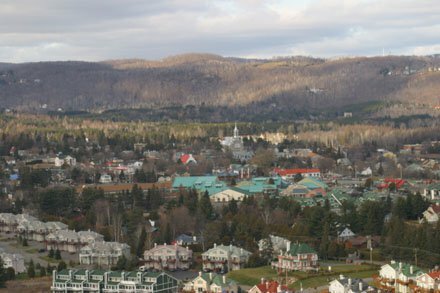 Born and raised in Montreal, Saint-Sauveur is the classic option as the nearby ski area that stays open longest. The final FIS Big Air of the season goes down in Quebec City and the overall winners of the tour are crowned. World Ski & Snowboard Festival launches Tuesday with Michael Franti and rolls on with five jam-packed days showcasing best in sport, music, art and mountain culture.